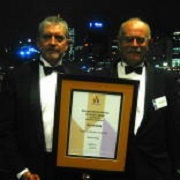 The ACT Division picked up a National Award for The Freycinet at this year’s MBA National Awards Dinner, held on 4 November. The Freycinet in Staverton Place (formerly Burnie Court) won the National Lifestyle Housing for Seniors Award – Small-Medium Multi Unit Development category. Paul Murphy, Managing Director, and Norman MacLachlan, ACT Construction Manager, were at the Dinner and accepted the Award on behalf of the Company.